The relationship between government, virtue, and wealth has held a special fascination since Aristotle, and the importance of each frames policy debates today in both developed and developing countries. While it’s clear that low-quality government institutions have tremendous negative effects on the health and wealth of societies, the criteria for good governance remain far from clear. In this pathbreaking book, leading political scientist Bo Rothstein provides a theoretical foundation for empirical analysis on the connection between the quality of government and important economic, political, and social outcomes. Focusing on the effects of government policies, he argues that unpredictable actions constitute a severe impediment to economic growth and development—and that a basic characteristic of quality government is impartiality in the exercise of power. This is borne out by cross-sectional analyses, experimental studies, and in-depth historical investigations. Timely and topical, The Quality of Government tackles such issues as political legitimacy, social capital, and corruption. 1 What Is Quality of Government? 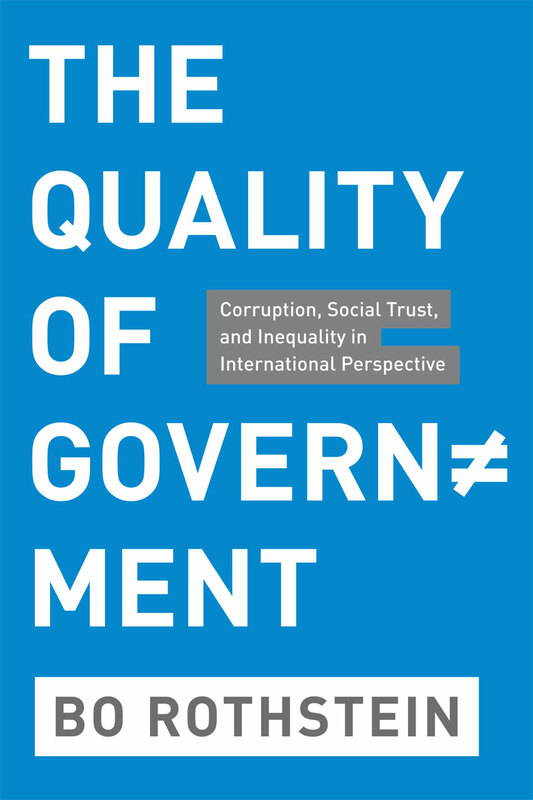 "In The Quality of Government, Bo Rothstein offers a rich and detailed discussion of the relationship between the quality of governing institutions and the outcomes citizens enjoy. . . . This work offers much more than a trite tautology. By showing why and how such factors matter, and showing that they can be more important than factors such as a country’s level of democracy or efficiency, the book breaks useful ground. . . . If you are sold on the idea of ’quality of government,’ this book will cement that. If you are not, this book will probably convince you." "What is ’quality of government’? How much does it matter, and why? And—a crucial practical issue for a world in need and upheaval—how can it be improved? To address these questions, Bo Rothstein deploys philosophy, statistics, psychological experiments, and history. He reviews what political scientists have written, adds a touch of public administration, and occasionally refers to the work of economists. Citing John Stuart Mill, John Rawls, and Brian Barry’s Justice as Impartiality, Rothstein boils down good government to impartiality, which is different from, and conceptually preferable to, democracy, the rule of law, and efficiency."